A nevus (plural nevi) is a small, mole-like malformation of your skin that can occur anywhere on your body. Nevi that contain melanocytes, the pigment cells that make melanin, are known as melanocytic nevi. When these nevi are colored grayish-blue to slate brown and are located on your head or neck, particularly in the white of your eye, this is Nevus of Ota. It is not known what causes this benign condition, but because the hyperpigmentation occurs on your face or head, it often causes cosmetic concerns. Furthermore, approximately four in 100 patients with it are at a slightly higher risk of getting intraocular melanoma, so if you have nevus of Ota, you should periodically see an ocular cancer specialist. Cosmetic camouflage has been around since World War II when plastic surgeons used it to treat massive burns on soldiers and pilots. These days, however, doctors use a combination of creams, liquids, and powders to cover discoloration or reshape facial or body irregularities. These include birthmarks, tattoos, scars, rosacea, burns, and more. Laser treatments do more than simply cover up the discoloration, they actually destroy the melanocytes responsible for the pigmentation. They are usually more effective in treating light-skinned patients than dark-skinned ones. High-energy laser systems are effective in lightening or even erasing different pigmented lesions, including freckles and birthmarks. They zap the lesions, targeting their intense energy on the melanosomes, minute pigment-carrying particles within the pigment cells. Pigment located just under the skin responds better to shorter wavelengths while pigment found deeper needs longer wavelengths that can penetrate your tissue deeper. 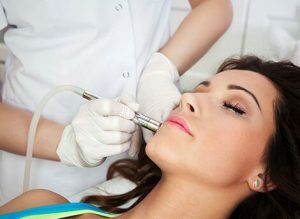 Furthermore, laser treatment is so precise that it can shatter pigment without damaging surrounding tissue. You can also expect to see some temporary darkening or lightening of the skin in treated areas before skin tone evens out. It is possible for the pigment to recur following laser hyperpigmentation treatment in some rare cases. Intense pulsed light (IPL) is a non-invasive, non-ablative treatment that shoots pulses of high-intensity light into your skin to shatter the pigment cells, which improves the appearance of the nevus of Ota condition. IPL treatment is precise enough to focus on the targeted area without causing harm to the surrounding tissue. IPL therapy also delivers multiple wavelengths in each pulse instead of one wavelength. As a non-ablative laser skin resurfacing treatment, IPL therapy targets the deeper layers of your skin without impacting the top layers, resulting in more gradual, natural looking improvement. For many of our patients, a crucial benefit of IPL laser treatment is the minimal downtime, as you can schedule to undergo this 30-minute procedure on your lunch hour before returning to your normal daily activities immediately following treatment. IPL treatments are very tolerable, with most patients describing the sensation as that of a rubber band snapping against the skin. Our doctors minimize even this discomfort through using contact cooling gel to keep your skin cool, or in cases of patients with very sensitive skin, a topical numbing agent.